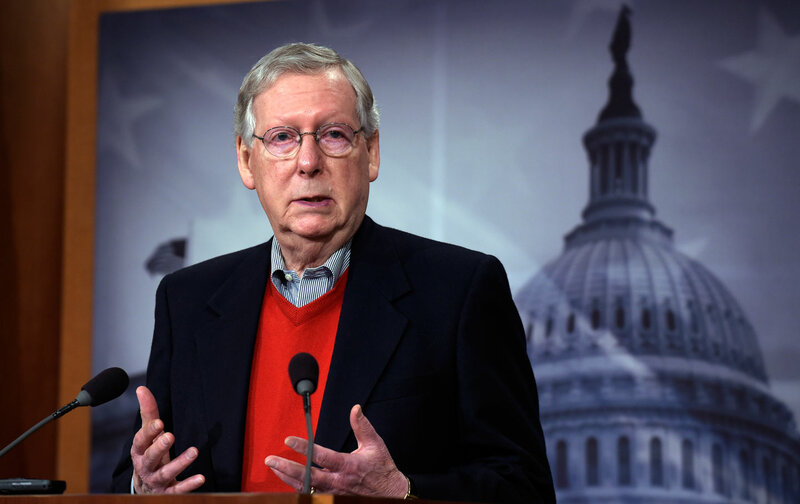 Is there anyone in American politics more lacking in political integrity than Senate majority leader Mitch McConnell? Maybe House Speaker Paul Ryan. I know, it’s tough; there’s a lot of competition. But McConnell has shown himself to be a craven partisan brawler, once again, in only the last few hours, by belatedly joining a bipartisan call by his Senate colleagues, along with Hillary Clinton campaign manager John Podesta, for an investigation into allegations that Russia is behind the hacking of the Democratic National Committee and that it did so to help elect Donald Trump. That was the claim in a bombshell Washington Post article over the weekend, which reported that the CIA has concluded not only that Russia was involved in hacking those Democratic accounts but that it did so, and leaked what it obtained, to help Trump’s campaign. The biggest reveal in the piece was that the Obama administration became so convinced by the intelligence community’s consensus about the Russian involvement that it directed top intelligence officials to brief a bipartisan assembly of congressional leaders in September, with the aim of generating support for a bipartisan statement about the intrusion into US politics. But McConnell blocked it. You can have skepticism about claims that Russia is behind the DNC/Podesta hacks, and many people do. None of us should take intelligence community claims at face value, even if there is growing consensus outside the world of US intelligence that Russia was involved. But McConnell’s role stands out here as particularly treacherous. That sounds like good-government, League of Women Voters kind of stuff, right? And according to the Post, at least some Republicans were willing to consider it. But McConnell said no, warning “that he would consider any effort by the White House to challenge the Russians publicly an act of partisan politics.” No such warning was made. On the heels of the Post’s reporting on Friday, The New York Times ran its own version of the story, adding the contention that the Republican National Committee’s e-mails were also hacked—but that information has not yet been released to the public. There’s some intelligence community disagreement on that claim, with the FBI insisting it is not clear that Russia hacked the RNC. All of this reporting brought senators out of hiding. On Sunday, a bipartisan group—Senate minority leader Chuck Schumer and Senator Jack Reed, both Democrats, and Republican Senators John McCain and Lindsey Graham—issued a joint statement denouncing Russian involvement in the hacking and demanding Congressional investigation into “the grave threats that cyberattacks conducted by foreign governments pose to our national security.” They went on: “This cannot become a partisan issue. The stakes are too high for our country.” That rankled some Democrats, since the attack was clearly partisan, and blocked Hillary Clinton from the White House. But it makes sense to frame the issue in terms of national security, to reach the widest audience. And guess what—it did that. It even reached McConnell, who came out Monday morning to issue his own version of his colleagues’ statement. “The Russians are not our friends,” he fulminated. Then he had the audacity to blame Obama for the breach. “The Obama administration for eight years attempted to reset relations with Russia, and sat back while Russia expanded its sphere of influence and intervened in Crimea, Eastern Ukraine, Syria, and attempted to bully Baltic countries. It defies belief that somehow Republicans in the Senate are reluctant to either review Russian tactics or ignore them,” he said. McConnell refused to comment on the September briefing where the Post reported he’d blocked a public airing of the issue. House Speaker Paul Ryan, by the way, won’t even go as far as McConnell, expressing concern about allegations of Russian hacking without calling for any kind of investigation. But Ryan didn’t stand in the way of a public warning before the election; McConnell did. All this news strengthens the case that Trump’s presidency is illegitimate, in the words of New York Times columnist Paul Krugman. He won nearly 3 million fewer votes than Clinton, and won the Electoral College only by edging her out by about 70,000 votes in Wisconsin, Michigan, and Pennsylvania. He was further helped by the decision of FBI director James Comey to reveal that his agency had discovered more e-mails that might have been pertinent to its investigation into Clinton’s handling of classified information, which turned out to be duplicates of those already examined. Comey’s intervention is widely credited, even by the Trump campaign, in tilting the race away from Clinton. The FBI director’s decision is even more outrageous given that he was aware of the intelligence community’s consensus about the Russian role in the hacking of Democrats, and refused Democrats’ efforts to release information about it. Comey had a choice: release evidence of Russian hacking, or release non-evidence of relevant Clinton e-mails, and he chose the latter. President Obama last week publicly directed his intelligence agencies to prepare a report on the evidence of Russian hacking, to be completed and delivered to Congress before he leaves office. There’s no word on whether that report will be made public. Meanwhile, a group of 10 members of the Electoral College, including New Hampshire Representative Carol Shea Porter, DNC member Christine Pelosi (Nancy’s daughter), and one Republican, have asked that the Electoral College receive sufficient security clearance to be briefed on the evidence of Russian hacking before voting December 19. “The American people have the right to free and fair elections,” Pelosi said. “We the Electoral College have a constitutional duty,” outlined by Alexander Hamilton in Federalist No. 68, “to determine that the president is qualified and independent from foreign influence.” She urged those concerned to lobby Congress “to insist on a classified briefing for members and for electors.” Clinton campaign manager John Podesta endorsed Pelosi’s proposal in a statement this afternoon. It’s unlikely to reverse the election outcome, but it’s important to demand as much information as possible before Inauguration Day. It’s nice to see some Democrats taking the lead, while McConnell tries to cover up his unconscionable partisan power play.